In his New years wrapup, Bobby from Dallas checks in on 2011, and shares the highlights of the year. No surprise, much of them center on his Dallas Stars and Jon, his boyfriend. January – Started nursing school and simultaneously tried to keep an updated blog. January – My blog was listed on the Yahoo! Sports site for the Dallas Stars. March – I received an email from a book publisher who asked me to review a new book on hockey in Texas “The Lone Star Skate”. They sent me a free copy of the book and I did my first book review…ever!! 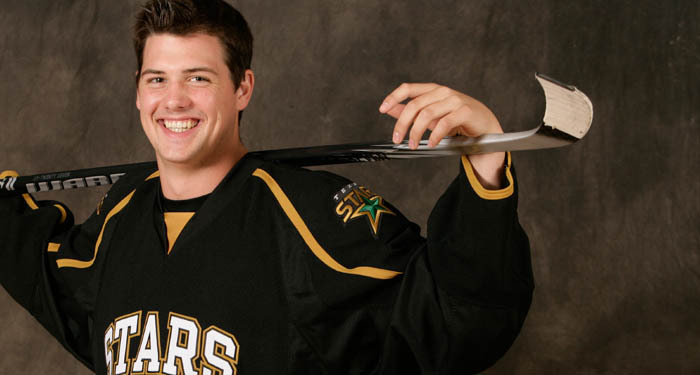 March – Updated my annual “Top Ten Hottest NHL Players” and got even more viewership! June – Not much going on in the hockey world, but the Stars did get a new coach, who seems to be doing extremely well! August – I was contacted by another hockey blog “Puck Buddy’s” and was asked to join them in their efforts to bring hockey and the gay community closer together! September – The hockey world started to come back to life and of course my life got much busier. October – I wrote my first post for Puck Buddy and received positive reviews and even more viewers! October – I wrote a post about taking my boyfriend to a hockey game, and with an enormous help from the men who work on Puck Buddys, it went above and beyond my wildest expectations! October – My article was posted and talked about on Outsports.com and The Voice (a Dallas gay newspaper). December – My blog hit 30,000 views…which means that in the year 2011 I had more than 20,000 views. Incredible! So what’s in store for the new year??? Well I’ve decided to make my New Year’s resolution about my blog. 2011 was a fantastic year for my blog, and all in all it was pretty great in my life! Or course you all can probably guess as the what the best part of 2011 was…and if you can’t refer to the timeline ‘August’ note above! Thanks to all of my readers who continue to amaze me with the fact that people actually care and like what I write about. I wouldn’t continue to do this if it wasn’t for you guys! This entry was posted in Dallas Stars. Bookmark the permalink.